New Years Resolutions? Do you make them? Do you keep them? I managed to make some changes in 2013 and keep them. I resolved to eat healthier and I did. I resolved to teach my family better habits and I did. It's not always worked out for me to make resolutions. My 2014 resolution is to improve (raise from the dead) my spiritual walk and journey with God's word. I accepted an offer to review a book without even a second thought. To date, Beth Moore has never le me down in her written words. I trust her to always bring me to the throne with truth. I've done many Bible studies of hers and I've gone to numerous conferences. I actually attended a conference prior to the LPL events. I knew God had an anointing on her life and I was drawn to her teaching like I've never been before of any author/speaker. What I love is that she always always requires us to be in God's word. She always encourages us to open our Bibles and to read the written word from our Bibles. Turn those pages. ﻿She encourages us to learn scripture. She leads by example. Never in a do as I say method. 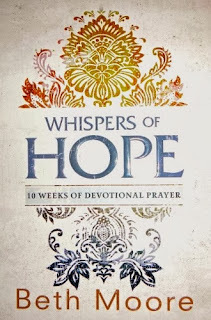 Whispers of Hope, 10 weeks of Devotional Prayer, by Beth Moore. In Whispers of Hope you find seventy daily devotionals - each complete with a Bible reading passage, a Scripture f the day and thoughts for the day. Beth offers a daily prayer guide to encourage us to pray in the format of the PRAISE acronym. If you are like me - you look at a blank page and often have no clue where to start when journaling your prayers. She gives people like me a guideline that helps keep me focused. I am one that needs accountability and also structure. This is my answer. Whether I start my day (as Beth always suggests) or end my day with this wonderful guideline and devotion I can't lose. God's word, encouraging words from Beth Moore and quiet time writing down my prayers is a plan sure to get me back on track with spiritual growth in 2014. If you have not gotten a copy of this devotional I suggest you look into it. Lets commit to being in God's word this year and keep one another accountable. Day 1 - In the Beginning. God is creative and He is orderly. Let's be creative and orderly this year with our Bible study. 2013 was a New Year that resulted in a New Me. Poor dead blog could have benefited from some wonderful happenings! Hoping 2014 will change that! I bought myself a Christmas present last December. I bought an Ignite Pack and it has rocked my world. The plan starts you out with a detox. An 8 day challenge is what it is called. Those 8 days began a transformation I never dreamed possible. 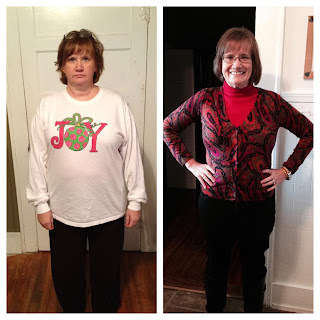 I was able to lose 12.4 pounds and many many inches. My family joined me soon after and we could not be happier that we took on the challenge and made the changes. We have lost 248 pounds as a family and are healthier than we have ever been. I no longer take prescription medicines and have no need for steroid shots for my aching swollen joints. One year and 65 pounds later I am feeling wonderful. I sleep all night. I eat healthier. No more sugar addiction and no more soft drink addiction. I could not be happier with my small investment into my health. Can't wait to see what 2014 holds for me. Oh wait - it holds lots and lots of exciting things! 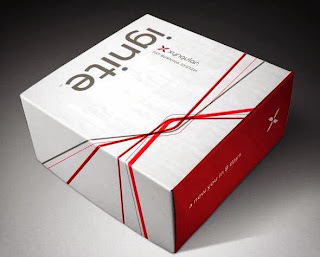 First up a challenge - body transformation challenge - Jan. 1-March 31! Hope to blog about it along the way. But a very very important event becomes front and center of our attention over the next four months. We will be having a May wedding and could not be happier for our daughter. Here's to 2014. And for your curious eyes - here's the evidence of 2013's transformation. The Joy on the shirt was not evident on the face. Praying the Joy of the Lord is my strength in 2014. Got this as a an email forward and thought I would pass it on. I may be the very last person on earth to hear of this recipe but I plan to give it a try. So - tried and tested by me - here it is as copied from here. Let me know if you try it please! 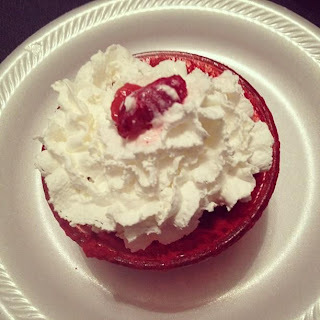 I made this using a red velvet mix with the angel food mix. 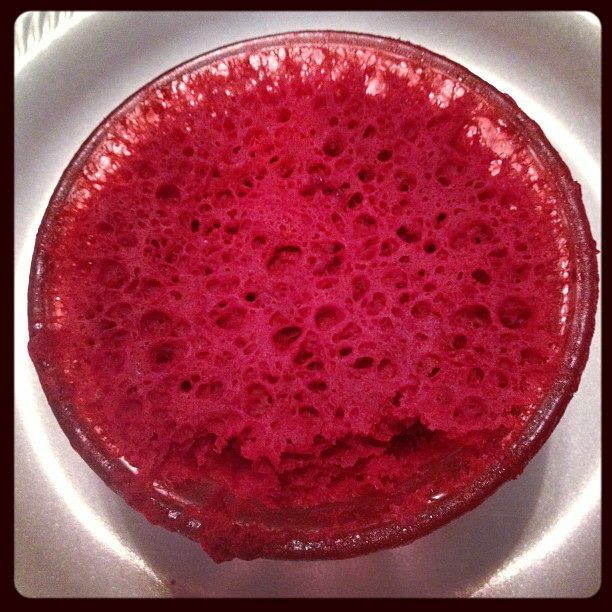 out 3 Tablespoons of the cake mix combination and mix it with 2 Tablespoons of water in a small microwave-safecontainer. 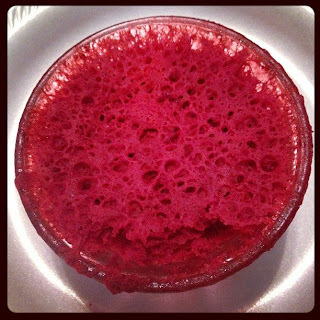 Microwave on high for 1 minute, and you have your own instant individual little cake! 1 minute in the microwave!" TRY various flavors of cake mix like carrot, red velvet, pineapple,lemon, orange, etc. Just remember that one of the mixes has to be the angel food mix; the other is your choice. The flavor possibilities are endless! The best thing is, you open both cake mixes into a gallonstorage bag, one that 'zip locks' or 'self-seals', or a container that seals tightly, shake the two cake mixes to blend and then make the recipe. Storage of mix is simple, put it on a shelf. No need to refrigerate, since the mix is dry. Always remember, that one of the cake mixes MUST be Angel Food. The other can be any flavor. The Angel Food is the cake mix that has the eggs whitesin it. So, if, anyone is allergic to egg whites, you can NOT serve this recipe. Since this Works for me Wednesday - think I'll go link up! MyMemories.Com - A review - A Sample and A Giveaway! Several years ago some friends encouraged me to "scrap". I was in love with the idea but couldn't get in love with the time that it was taking to get started. I made about three pages and sorted lots of pictures. That is as far as it went. Along came facebook and twitter and blogland. And now, Pinterest. All of these lovelies have given me the desire to take lots of photos and so now all of my photos are suddenly on computer and not being printed. So - scrapbooking is still on the back burner. I've wondered how what on earth I would do with my photos. I still want to have them in hand to be able to show. It' rather inconvenient when visiting family to say "Let's pull out the computer and I can show you my pictures". Alas, MyMemories has entered the picture and I am free from the anxiety of what to do with my pictures! I CAN scrapbook my pics with my memories suite, but from the comfort of my laptop and there will be no materials to deal with. Holy Cow! This is right up my alley. I can have the awesome layouts digitally and then have them printed in a beautiful little book! How cool is that? A digital scrapbook? I am also blessed to be able to offer this wonderful software to one of you as a sweet prize! I am so very new to this and my work will be so bland compared to what most are already creating - BUT I am looking forward to expanding my abilities with a little practice and with the help of some great tutorial videos offered by Lisa at mymemoriessuite.com. Follow along on facebook and see what others are creating. This is my very first page. It is a work in progress but we were celebrating a certain birthday for a couple weeks, so I will be adding to it soon. Lots and lots of pics to scrap! I know this is just the beginning of a wonderful relationship with a great company. I can't wait to share some projects that I have planned for the future. Mod podge and my memories suite sounds like a match made in heaven. They have a wonderful blog over here. Go and "Like: them on facebook. And you can follow them on twitter. Leave me a comment for each thing that you do and I will give you an entry for each one. And, if you want to go ahead and get busy digitally scrapbooking - here's a special discount code for you to use. 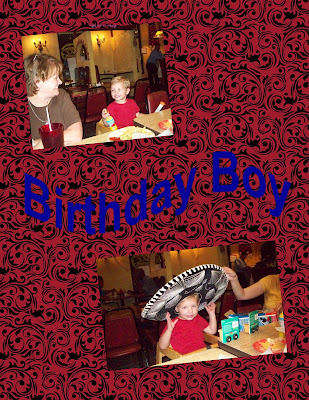 My Share the Memories code provides a $10 discount off the purchase of the My Memories Suite Scrapbook software and a $10 coupon for the MyMemories.com store - $20 value!) Use the code: STMMMS11896 and you will automatically be given the discount. So - go ahead and check them out and let me know what you like. I will end the giveaway on Friday night, October 24 at 9:00 and have a random drawing. Trevor Bradshaw has written and article on the importance of exercise - more particularly about making it an integral part of Life as a Survivor. He is my guest today - in honor of Breast Cancer Awareness Month. This past Monday, I was a little taken aback to see bright pink wristbands and cleats adorning several football players- even with how important National Breast Cancer Month is it’s a bit of shock to see it embraced so thoroughly in such a masculine, physical arena. Except in one aspect it makes complete sense for athletes to embrace the fight for a cure. After all, they may be actively involved in one of the best treatments for cancer there is- exercise. New reports by the American Council on Exercise show that while breast cancer survivors tend to be more overweight and sedentary than women who never have had cancer, exercise not only plays a crucial role in decreasing breast cancer patients’ chances of recurrence but also is directly associated with a 30 percent decrease in mortality rates. Unfortunately, as any cancer survivor knows well, when you are undergoing treatments like chemo and radiation therapy commonly the last thing you want to do is exercise. But exercise has many benefits for cancer survivors- it can lower fatigue, lessen nausea, and reduce the risk of anxiety and depression, as well as contribute to better fitness and a better body composition. Body composition in particularly is an important factor for breast cancer survivors as obesity is known to increase mortality rates by nearly 30 percent but even cancers from environmental toxins like pericardial mesothelioma and papillary mesothelioma have much higher survival rates when patients have regular exercise. Of course it can be difficult for patients who have just received chemotherapy to begin exercising again as the treatments often leave patients exhausted. One key recommendation is to begin with very low intensity, moderate workouts, and take advantage of a regular exercise program. A routine similar to the one offered by the American Council on Exercise, which encourages aerobic activities that engage all the major muscle groups at moderate intensity for 150 minutes each week, is an ideal fit for most breast cancer survivors. As with everything, patients must be careful to follow their doctor’s recommendations about exercise, since severe anemia can delay any strenuous activity and patients undergoing radiation therapy must avoid swimming pools. Ultimately however, the importance of exercise after cancer simply cannot be overstated. 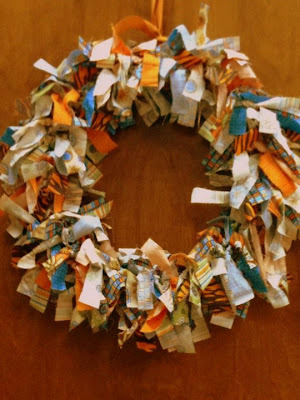 I've been looking at these rag wreaths since last fall! It only took me a full year to decide that I really wanted to make one. I had the fabric bought and well....... bought. That was as far as I got. Til now. I decided that I wanted to make one and well I did. About two hours of cutting and tying ribbon onto the wreath and it was finished. Complete! I love the colors and am very pleased with the outcome!. This is what I started with (actually - it's what my next wreath will start with). Since - well - I didn't take the before or during pics. (as usual). I took before pic of my next wreath! 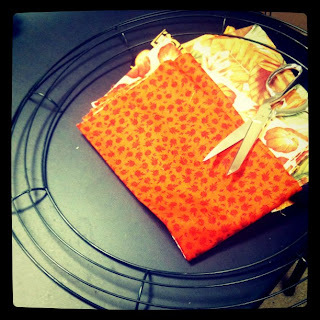 Scissors, fabric and wire wreath! How simple is that? I saw these wreaths all over blogland and Pinterest. No clue where I saw it first or I would gladly give them credit. I should give all of the credit to Pinterest. It is that awesome (time consuming wildly addicting) website that makes me think I am crafty! 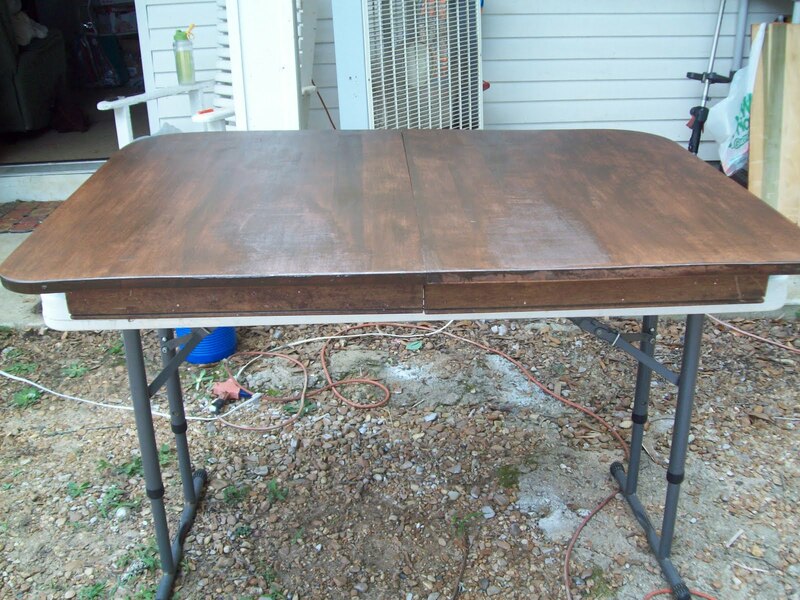 It just looks to wonderful and makes you think you can do all things Pinterest! Anyway, it was easy and I think it's cute - so that's what matters most! I'm linking up this post over at the CSI Project. 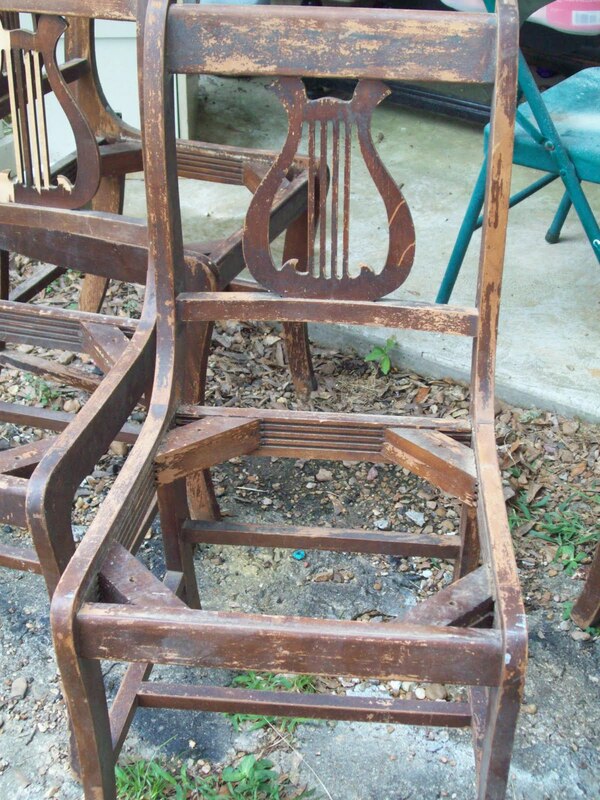 A certain table and chairs were stored for a couple years without any attention. 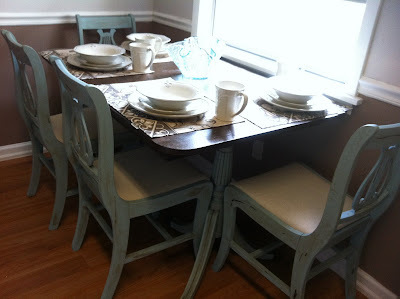 The purchase of a new home brought about many projects and this table and chairs was one of them. Here are a few in progress pics. We removed the vaneer top from the table since it had dry rotted and was not usable. Did some serious sanding and then put on stain and poly. That was all for the top. 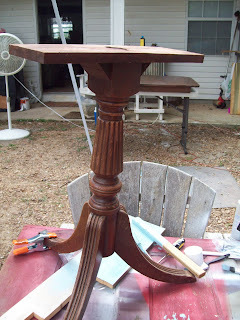 We merely painted, glazed and distressed the two pedestal's. The best part of this project was the cost. I had a gallon of mis-tinted paint on hand. We had the stain from previous projects as well as the poly. 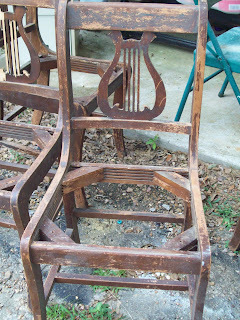 The seats were covered with a drop cloth that cost around $10.00. So - the project was a $10.00 project and Ashley adores her new furniture. 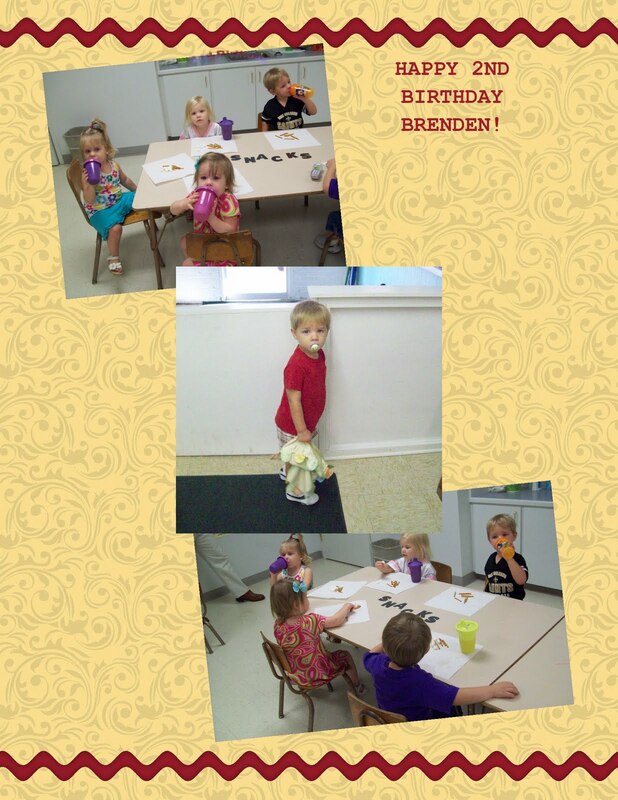 The picture at the top is the finished project sitting in her dining area. She had a small space so we left out the leaf. This fits perfect with her new home.